Cell phones, almost all of which are now “smart” phones, have become such an indispensable part of everyday life for many Californians that drivers tend not to think twice about using them in the car. But though they may be using a smart phone, using it in the car isn’t smart at all. 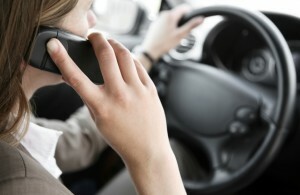 Hand-held cell phone use while driving is banned for all drivers. All cell phone use, hand-held or otherwise, is banned for drivers under 18 years of age. All cell phone use is also banned for school bus and transit bus drivers. Texting is banned for all drivers, except in the case of voice-activated, hands-free devices, in which case drivers over 18 years of age may dictate, send, or listen to text-based messages. Violating the texting ban is a primary offense, which means that a driver can be pulled over and ticketed for texting. All other violations are secondary offenses, which means that a police officer can only cite a driver for it if they were first pulled over for another reason. The enforcement of these laws is important to understand as any citations for such violations can impact a personal injury claim if you have been involved in a distracted driving accident. It is our hope that everyone stays safe on the road, but if you were injured in a car accident caused by a negligent driver, we can help you get back on your feet.